Rodrigo Bentancur, 20, is the Juventus and Uruguay central midfielder who has won many plaudits for his influential performances for his country at this year’s World Cup 2018 so far. Former Arsenal midfielder Cesc Fabregas was impressed by his performance against Saudi Arabia. When asked about Juventus’ Bentancur, Fabregas told BBC Sport, as per the Metro: ‘I think he’s one of the positives of the tournament, individually, so far. ‘He’s a young boy who signed for Juventus. He hasn’t played a lot but you can see that he has a lot of personality, likes to play, he’s not scared. But who is the midfielder and what is his background? 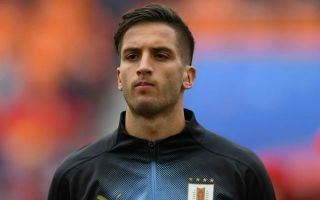 Bentancur moved to Juventus from Boca Juniors for a reported fee of £8m as reported by The Sun and made his senior Uruguay debut last October. The Argentine club signed him at the age of 13 and attracted by his performances at the Under-20 World Cup for Uruguay. His rise to stardom has been rapid and by the 17, he was part of the first-team squad at Boca and made his debut in 2015. He has honed his skills in the central of midfield and uses his height and presence to win battles in the middle of the park – however – it is his ability to move the ball and pass from deep that has been impressive. As he is being tall and technically astute, comparisons have been drawn with Manchester Utd star Paul Pogba. He won championships with Boca and has had a good first season with Juventus by winning a domestic double for Max Allegri’s side making 17 appearances in Serie A and featured five times in the Champions League. The future is bright for the young star as his reputation continues grow.